Scotland’s First Minister Nicola Sturgeon has said she was “happy” to take a phone call from US President-elect Donald Trump. 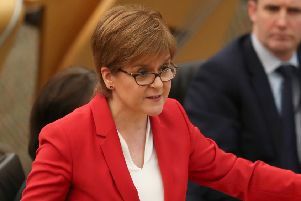 Ms Sturgeon said the two politicians discussed the “long-standing links between Scotland and the United States” during the “short, introductory” conversation on Friday. “It was a short call, but one I was happy to take,” she told Bauer Radio’s Scotland’s Talk-in programme. During the presidential election campaign, Ms Sturgeon was critical of Mr Trump, and declared her backing for Hillary Clinton. Following his victory last month, she has said she will not allow her political differences to get in the way of “deepening and strengthening” links between the two countries. But Ms Sturgeon also warned she will not maintain a “diplomatic silence” in the face of racism, misogyny or hatred. Mr Trump’s business interests include two golf resorts in Ayrshire and Aberdeenshire. The First Minister said it was “important that we understand his plans for those”. Asked about a newspaper report claiming that Mr Trump has dissolved an advisory group aimed at ensuring his Aberdeenshire resort meets required environmental protections, Ms Sturgeon said: “Nobody can escape the environmental responsibilities that the law imposes on them and that’s true of Donald Trump as it is of any other business owner”.